Effects of Drinking - Does Alcohol Make You Fat? The short answer is yes; alcohol can make you fat - depending on how much you drink. The body turns some of the alcohol into fat, which ends up on you stomach - hence the "beer belly". This is because there are calories in the alcohol and we all know if we are taking on more calories than we are losing, we are going to put on weight and, in some cases, get fat. But it is not just the calories themselves that make you fat, it is the process they trigger. Research has shown that when the body is met with a sudden intake of calories, it wants more of the same. In other words it wants more alcohol or food - this is when alcohol can make you fat. Generally, when we drink we are mixing socially. We are in a relaxed frame of mind, one drink helps us relax more and it triggers the need for another drink - or food. If we drink before a meal, which is common, our appetite is roused and we are ready to eat. This means we can find ourselves drinking and eating more than we normally would. Of course, there is nothing wrong with this, as it is all very civilized and socially enjoyable. It only becomes a problem when we are eating and drinking too much too often. It also depends on what we are drinking and eating. Not all alcoholic drinks are created equal in the fat-making stakes. Some drinks have additional fat producing qualities because of the carbohydrates in them. 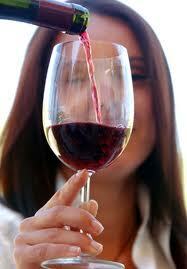 For example, red wine and dry white wine have few carbohydrates because the sugar has been turned into alcohol. On the other hand, sweet wine has more, and fortified wines like port and sherry have more still. Of course, beer and lager are very high in carbohydrates, and cider is not far behind. Drinkers of whisky and spirits will be pleased to know there are virtually no carbohydrates present. All this makes sense, because the sweeter the drink the more sugar would be present and sugar is a carbohydrate. Do We Have To Give It All Up? I certainly hope not - I do like that glass of red wine with the evening meal and I am sure I am not alone. It just means we have to be aware of what we are drinking in exactly the same way we need to be aware of what we are eating. Too much of anything, even healthy food, can make you fat. The same goes for alcohol. There is no reason why a moderate amount of alcohol with its physical, emotional and social benefits cannot form part of a healthy diet and lifestyle. You can make sure you are eating the right foods and getting the healthy, fat-burning fats your body needs by visiting http://www.squidoo.com/how-to-lose-stomach-fat-in-your-50s. William Burnell has studied and followed a healthy lifestyle for many years and knows how rewarding it can be.In fact, there are such things as fat burning food.